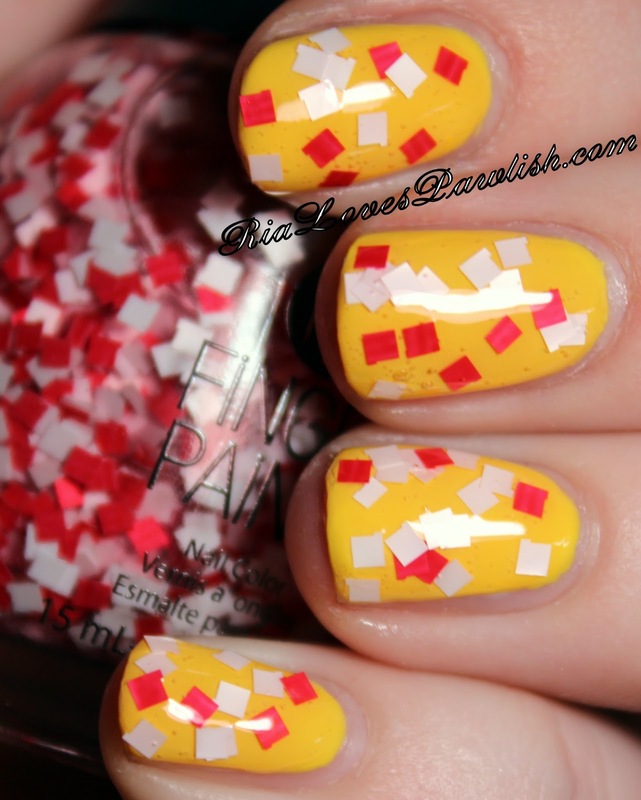 today i have Picnic Blanket from FingerPaints Picnic in the Park collection to share! (it's a press sample, kindly provided to me for review). this glitter is perfectly named, it's red and white square pieces suspended in a clear base... definitely gets you thinking of your traditional picnic blanket! it's absolutely adorable. sadly, like every other large glitter i have tried, it's quite difficult to work with. you must dab with the brush carefully and place the pieces, it absolutely will not flow off the brush. to get the most pieces, hold the bottle upside down with the brush in it before each nail. with dabbing and placing, you will get air bubbles. that said, i used it over FingerPaints Frosty Lemonade (press sample) and it makes the cutest mani... makes me think of picnic food! i just wish it was more user friendly. definitely add top coat to help your mani dry as you will most likely have a thick layer of polish! one coat Picnic Blanket over one coat FingerPaints Frosty Lemonade, finished off with one coat Salon Perfect High-Shine Top Coat.